HiWave Technologies which develops and sells electronic components and devices that utilise innovative sound and touch technologies, announces the DyadBA3 module to enable consumer audio product designers and manufacturers to rapidly introduce power-efficient, Bluetooth-streaming stereo loudspeakers to global markets. The module significantly extends battery life in small-format, portable wireless speakers. Combining HiWave’s HiAS2002 Audium amplifier chip with CSR’s BlueCore5 (BC-05) Bluetooth technology, the DyadBA3 supports AVRCP and A2DP Bluetooth audio profiles and delivers two channels of 13W burst power output into 8-ohm speaker drive units. aptX® and HSP (headset) profile support is in development. The HiAS2002 extends battery life by up to 20 times at normal listening levels, compared with Class-D amplifiers. The amplifier’s envelope-tracking technology eliminates clipping at high audio levels, ensuring clear sound at all volumes. The DyadBA3 module may be entirely powered from a single lithium-ion or lithium polymer battery. It incorporates circuitry for charging from a USB host or AC power adapter. HiWave’s Audium audio processing includes multi-step volume control at 1.5dB per step, a mute function with adjustable ramping, and 16 user-definable bi-quad filters for implementing equalisation, voicing, tunable bass extension and stereo-wide effects. The DyadBA3 module self-configures on power-up and invokes power-saving modes when no audio signal is present. It incorporates a stereo microphone input, making it also suitable for desktop or portable VoIP-phone audio portal applications. Sized 110 × 46 × 25mm, the DyadBA3 module makes an ideal front-end to HiWave’s patented BMR (Balanced Mode Radiator) speaker drive units. Pairing the module with two HIBM36S12 BMRs creates a compact, fully portable Bluetooth stereo speaker capable of delivering room-filling sound. For greater volume and frequency range, a pair of HiWave’s new HIBM36S05 BMRs will deliver an even higher level of full-range, widely dispersed sound. 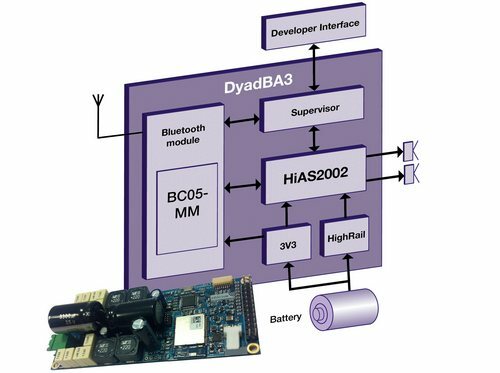 HiWave is sampling its key customers now, and the DyadBA3 module will be available in mass production quantities in August.